Let me tell you right off the bat, I am a minimalist in my use of hair styling products. I have very thick hair that when slicked with too many heavy products begins to look flat and oily. On the other hand, my ends tend to get dry and somewhat frizzy as a result of my (at best) bi-annual haircuts. My haircare routine pretty much consists of an everyday wash, which unfortunately, is a must for me or I run the risk of rocking a grease-laden mane come day two. The only hair products I tend to use loyally on a daily basis live in the softening and texturizing categories. I picked up a bottle of the Bumble and Bumble Hairdresser's Invisible Oil back when it first came out and have used it on rotation with my beloved MoroccanOil Treatment ever since. Post shower, I pump some of the oil into my palms, warm it up in my hands and then finger-comb it through my mid to end lengths for smoothness and manageability. I find this to be a lightweight and lightly scented oil that is quickly absorbed and leaves behind no sticky residues, especially when used on damp hair. What I like about the B&B as opposed to the MoroccanOil is that it also has UVA/UVB Protection to aid in protecting hair color from fading in the sun, which can be a real pain come summer. 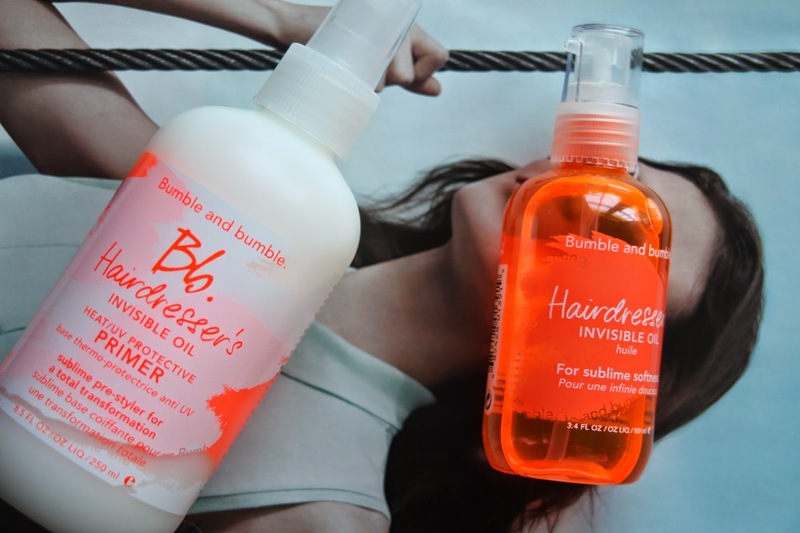 With my love for the Hairdresser's Invisible Oil growing you can imagine my excitement when I was handed a sample of the latest release from Bumble and Bumble: their Hairdresser's Invisible Oil Primer. At first, I was a bit confused as to what the exact purpose of this was, as I often am with hair 'primer' products. I don't normally see the need for an extra step in the haircare routine that doesn't do anything entirely new, but I must say, this product has really impressed me. I used up the entire sample-sized spritzer within days and found myself running to my local Sephora on a mission to pick up the full size. This heavenly scented milky concoction contains the same combination of oils that make up the Invisible Oil, but oddly enough I find this version even more nourishing than the concentrated one. I have been misting this through my damp strands and then proceeding to style my hair as usual, and I really notice a difference in terms of heat protection, style longevity, and overall softness. I find that when using this my hair has more volume than normal which is hard to come by in a softening product, so this one is definitely a keeper. It is super simple to use and I love that it acts as a detangling spray; all you need to do it spritz and comb through. I have tried the Kerastase Apres-Soleil serum, I think that one it has a bit more silicone feeling to it than this one, which I find lighter. I love this one and it is cheaper than the Kerastase, I have only gone through about a quarter of the bottle in the last 6 months, and I use it about 4 times a week (multiple pumps). I would recommend this one if you have a similar hair type to mine - really like this and the spray is awesome and comes in a larger bottle! I really enjoy reading your blog and love your honest opinions of the products. I have been using the invisible oil and recently received a sample of the primer from sephora. I was just wondering, do you use the primer before or after the oil?